Thanks for the sentiment towards keeping my conservative Irish mother (who voted for Trump) out of the USA. That said, these snakes who inhabit an Ireland I no longer recognize, and which was nothing like this even in the 1980s, need to be driven into the sea. A weird country that has always been a bit off. The ones that got out were the smart ones. And all of them in NYC (where a vast amount of them end up) are left-wing nutcases. Drunks, too. For anyone interested, I recommend a new book called “Say Nothing” by American Patrick Radden Keefe about the appalling abduction and murder of Jean McConville by Gerry Adams, Delours & Marian Price. What a crazy country and people! Oh, as usual, the Irish-lovers show up to cry about their great families. Well, I’m “Irish” too and I say to hell with their country and let’s keep them out of our country. Ever hear what their exchange students do in California? Check it out. Oh, my hero. Thanks for posting! Heck, if it weren’t for the Polish immigrants, there wouldn’t be any Christians left in Ireland. It disgusts me what this guy did in the presence of Mike Pence - a decent American put down by a typically smug, left-wing Irishman. When will we learn not to put up with this? God invented whiskey to keep the Irish from ruling the world. With couples like this there won’t be any Irish to drink it, will there? I believe I’ve read it and they called it Sodom and Gomorrah. It didn’t end well. Apparently it defines him sufficiently to want to rub other people’s noses in it. I’m glad I wasn’t the VP on this day. I think that is true. That and 2 World Wars killed all the brave and strong. Think what the gene pool left after all of that. Then again France was a power house through WW1. Look at them now. They might pull it off. (Not). 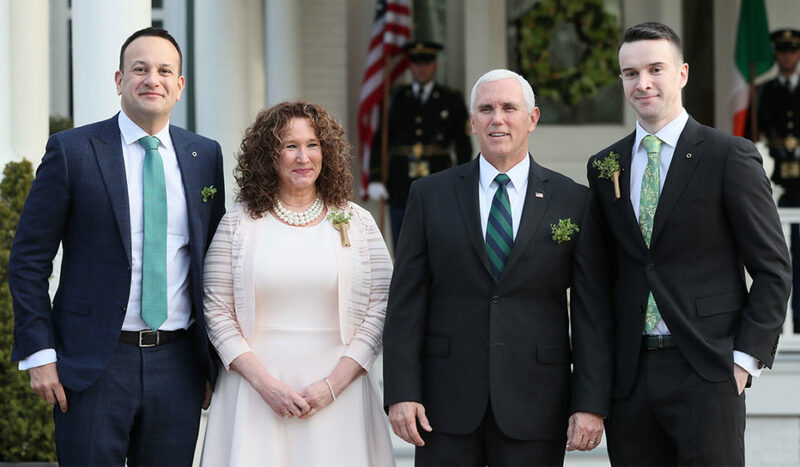 "The Irish prime minister, Leo Varadkar, who is gay, brought his partner to a meeting on Thursday with the US vice-president, Mike Pence..."
So says another militant homo. A pervert proud of his perversion. What else is new. More likely a mean strawberry tart.